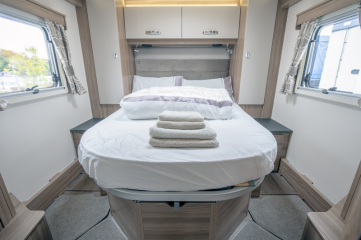 The Bessacarr 599 is a luxurious top of the range 4 berth Motorhome and is Ideal for a couple, but also has the availability to convert the dining area to another double if required. 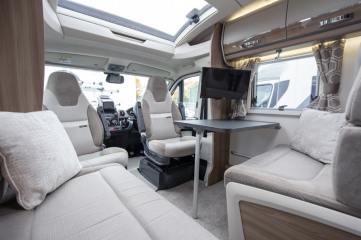 This motorhome is fully fitted with almost every extra and would be ideal for long term touring on the continent. rear bedroom model with a large walk round bed, separate luxury shower and separate washroom, large garage and pull out panier locker give ample outside storage. This is the black cab luxury edition with streamlined low-profile body with lavish interior, the dash has bronze effect fitments, the leather steering wheel has radio and phone controls, hands free phone system, alloy wheels, twin rear camera system, one for normal driving as a rear view mirror, the other automatically changes when reverse gear is selected. fitted with a built-in large 4.9 metre roll out awning. Provision for two 13kg gas bottles. Luxury starts here, the Bessacarr 599 has an impressive sky view panoramic sunroof, curved upper lockers with gloss inlay, Silverado soft furnishings with wrapped edges exude luxury, the seats are all specially sculptured for extra comfort, shoe locker on entry, pleated cassette blinds on all windows, 19 “ Twin Televisions with one in the lounge and another in the bedroom, Full auto roam satellite means you can watch your favourite programmes almost anywhere. The Kitchen in the Bessacarr 599 is compact, but fully fitted with everything you could need to cook a meal, the hob has 3 gas rings and an electric ring which works from mains electric which is useful when on a campsite, separate gas oven, separate grill, Microwave oven, large dometic 138 litre slimline fridge with separate freezer compartment has automatic power source selection. omnivent overhead 3 speed extractor fan, Overhead storage lockers with plate and cup racks fitted, large 3 tier storage cupboard, pull out drawer for bits and bobs, acrylic splashback with LED lighting, granite effect scratch resistant worktops. The bedroom is at the rear of the Bessacarr 599, the large double bed is fitted with a luxury deep memory foam duvalay mattress containing freshtec which is a high specification foam giving maximum airflow for a cool and comfortable nights sleep, the bed measures 2.22m x 1.33m, which is 6 ft 7” x 4 ft 4” , the dining area converts to a double measuring 2.09m x 1.23 m , 6 ft 10” x 3ft 5” , wardrobes each side of the bed with interior lights, large storage area under the bed which lifts up on gas struts, 19” TV with satellite and DVD player, 2 night time reading lights above the headboard, USB socket, twin 240 volt socket, 12 volt socket, vanity mirror and cupboard, ample overhead storage lockers. 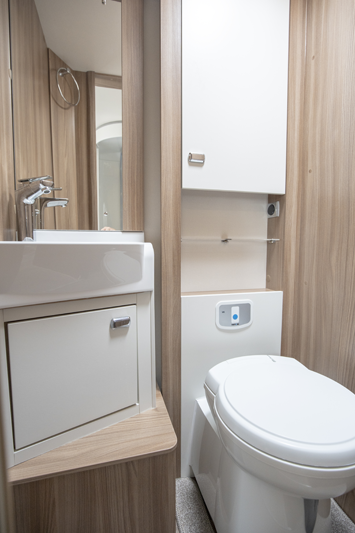 The Bessacarr 599 has a separate luxury washroom and toilet, the large shower cubicle has half moon sliding doors the shower tower is illuminated. ecocamel shower head with an on off button which uses 30% less water, LED downlighters, the toilet room has an electric flush swivel toilet, vanity unit with storage and built in sink unit, heated radiator, mirror, overhead storage locker. 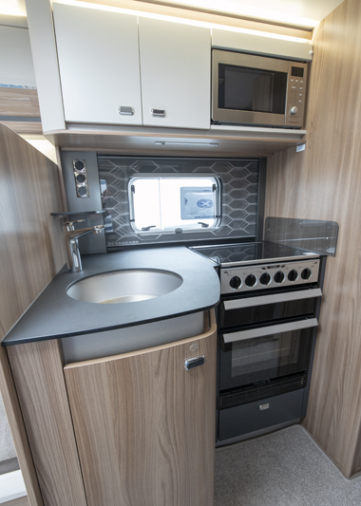 The Bessacarr 599 is fitted with the latest hot water and central heating system made by Alde. The central heating is by wet radiators similar to a domestic house, this gives a very clean non fume heat, the digital touch screen programmer is easy to use and also controls the hot water , the system can be run off gas or mains electric, sensors in the motorhome mean the central heating can be zone controlled, the system can be left on whilst the motorhome is being driven, fitted with 2 x 120 amp batteries which are coupled to the solar panel and to the engine means you will never run out of power. the 599 has a superb lighting system with zone controlled dimmable low energy lighting throughout, Wi-Fi system.